Gran Canaria has some stunning beaches that tick all the boxes for relaxation and family fun. It also has some prime spots for surfing, kiting, windsurfing, swimming and other adventure sports. 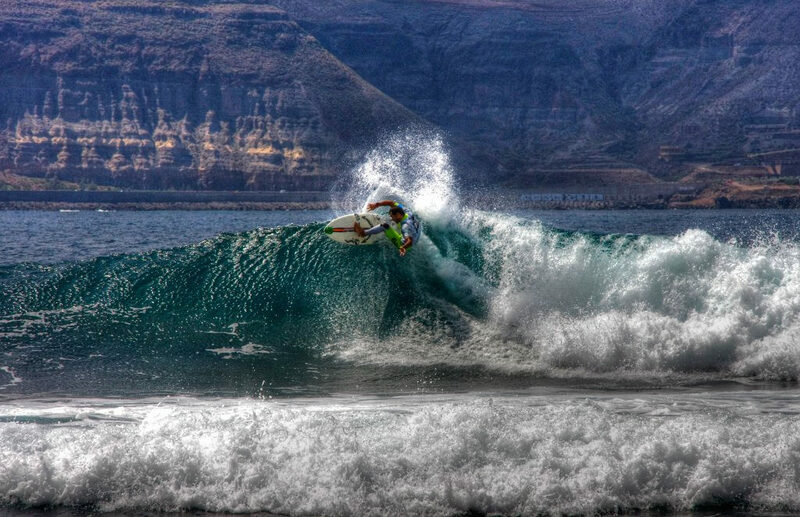 But what are the best beaches in Gran Canaria for surf and adventure? Gran Canaria is one of the Spanish Canary Islands, located in the Atlantic Ocean around 100 miles off the coast of Africa. The Canaries are on the edge of the tropics, meaning year round good weather, making them perfect for beach and water sports holidays. Take your board or kite gear on the plane or hire it there. Alternatively find a kite, wind or surf school and learn a new sport. Book your holiday, hire a car and use this article to navigate your way to the best beaches in Gran Canaria for surf and adventure. Front and centre and in the island’s capital, Playa de Las Canteras has a reef just offshore and plenty of space for surfers of all abilities. It’s especially good for learners and lovers of the growing surf scene. Pro surf spot and within a few minutes dust track drive of the capital. There’s more exclusive beaches to be found on Gran Canaria, but the waves here are excellent easily making it one of the best beaches in Gran Canaria for surf and adventure. Two hours from civilisation, this is a backpacker’s beach and a bit of a find. There’s no facilities to speak of and you’ll need to trek your way in from Tasartico. It is possible to jump a water taxi from Puerto de las Nieves and take the easy route. We’d rather walk down the steep-sided volcanic ravine to the sea. What this beach lacks in size it makes up for in location. There’s a short strip of sand behind the harbour wall. Swimming here, you’ll be underneath the towering cliffs that define the north coast of Gran Canaria. There’s a small marina for sailors, and anyone interested in trekking will find themselves staring inland, making plans. Another north coast beauty. Galdar is both region and town and host to the IBA World Tour (bodyboarding). Head 5km from Galdar town towards La Punta de Sardinia. There’s a 400m sandy beach beside Sardinia Port – the best thing about this beach is that it’s protected from the extremes of the coast, giving you some calm. Pozo Izquierdo is a favoured spot on the south-east coast, just as the island curves away to Maspalomas. The PWA World Championships used it this year and it’s even home to the Centro Internacional de Windsurf (you don’t need a translation , do you?) Locals know it as El Arenal , with winds from the left over waves that top 3m. Mainly rocks but there’s a dash of sand. Huge waves from a NW swell batter Gran Canaria over the reef of this north coast village. There’s no sandy spot to lay your towel and relax – appropriate really as it’s not that kind of beach. 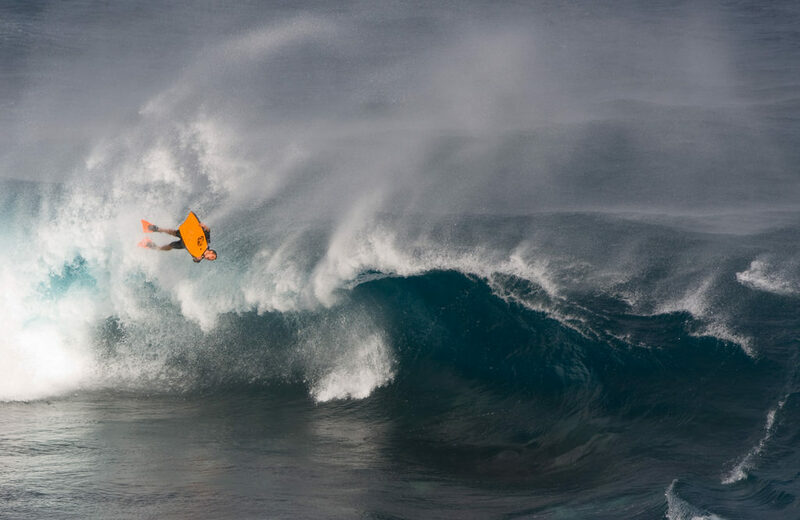 Newbies are advised to sit it out and get their inspiration from big wave riders. Head north from the main tourist destinations towards the from the capital Las Palmas and you always feel there’s an adventure starting… Off the motorway there’s La Laja. It’s not the greatest location but has it’s own no-frills charm and worth a try. Literally just around the corner from the more popular Playa Aguila is our favourite beach in the south of the island, San Agustín. Windsurfers and kitesurfers launch off the south side off the headland and it’s suitable for beginners. It’s more a leisure beach, but if you want to avoid the hustle of Maspalomas it’s perfect. Maspalomas is a huge beach fronting the Maspalomas Natural Dune Reserve – and some days the sky is painted with kites. The lighthouse at the southerly end of the dunes is a favoured spot. Maspalomas can be great in winter when there are more southerly and easterly winds. We hope you find our 10 best beaches in Gran Canaria for surf and adventure useful. It’s a collection of some of the better known spots, plus a few teasers to show you that as with most holiday destinations, there’s always more to find. If the best beaches in Gran Canaria for surf and adventure have whetted your Canarian appetite then check out our Gran Canaria adventure articles and discounts.